This brief overview looks at the history of Heathrow and the area on which it was built with the aid of four historical Ordnance Survey maps. 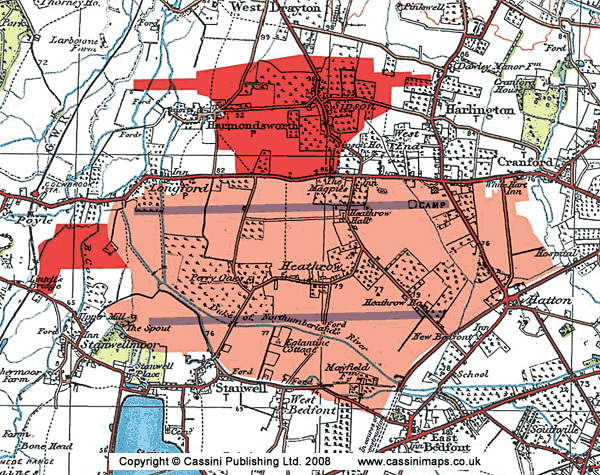 In each case the present-day airport (pale pink) and the proposed expansion (pink) have been superimposed. In May 2010, the new coalition government announced that the most recent plans for the expansion of Heathrow Airport, which both parties had opposed when in opposition, would be cancelled. This map was created from Britain’s first national mapping project, Ordnance Survey’s One-Inch (‘Old Series’) maps which were first published between 1805 and 1874. They have all been carefully scanned, digitally re-projected and enlarged to match the present-day Ordnance Survey Landranger® series. The land Heathrow occupies today is in the southern part of the London Borough of Hillingdon although historically it covers two of the ancient Middlesex parishes of Harlington and Harmondsworth. Domestic settlement in the area probably dates back to 500BC and a Roman camp existed on the site now occupied by the airport. The proximity to the major east-west route of the Bath Road (now the A4) doubtless influenced the development of all the villages and hamlets in the parish. Heath Row, as it was then known, was first mentioned by name in documents from around 1410. The parish mainly comprised flat fields that were irrigated, and at times flooded, by several waterways that drained into the River Colne. Two of these, the Duke of Northumberland’s River and the Longford River, were artificial. The former was constructed in the 1530s to provide additional power for Isleworth Mill, the latter in the 1630s to improve the water supply to Hampton Court. The subsequent development, if so it can be called, of the parish was little more than the gradual increase of cultivated land centred on a few small hamlets. The Ordnance Survey maps pick up the story in the early 19th century. As a study of other maps from this period will show (and those of the whole country are available from http://www.cassinimaps.com) the British landscape in the early and mid 19th century was typified by small farms and small villages, interspersed with woods and open countryside and linked by a network of ancient roads and tracks. The area around Heath Row was no exception. In the late 19th century, orchards and market gardens began to replace arable land and some new buildings were constructed, but in general the character of the area altered very little. This was about to change. This map was created from Ordnance Survey’s Revised New Series (in colour) maps which were first published between 1896 and 1909. They have all been carefully scanned, digitally re-projected and enlarged to match the present-day Ordnance Survey Landranger® series. Heathrow’s aviation history goes back to the First World War when the site was used as a military airfield, although little evidence remained by the time of the Popular Edition map of 1920. In this year the airport was closed for various logistical reasons including bad communication, the bumpy nature of the ground, its tendency to become boggy and muddy in winter and its frequent covering of mist. As the map showing the current expanse of the airport shows, these problems have since been overcome. In the late 1920s the Colnbrook by-pass was opened which led increased industrial development in the area. One result was the re-opening of the airfield, as the Great Western Aerodrome, by Fairey Aviation as a centre for aircraft assembly and testing. It had become clear by the 1930s that civil aviation would increase (though few would have predicted by how much), and the government began to make provision for the capital’s air services. The plan was to expand the two existing aerodromes at Croydon and at Heston, to the east of modern-day Heathrow, and to add two new ones, at Fairlop in Essex and Lullingstone in Kent. Heathrow’s flat terrain, proximity to London, good communications and comparative lack of housing must already have made this an attractive candidate for expansion, despite its other disadvantages. Work was under way on all these projects when war was declared in September 1939. This map was created from Ordnance Survey’s Popular Edition maps which were first published between 1919 and 1926. They have all been carefully scanned, digitally re-projected and enlarged to match the present-day Ordnance Survey Landranger® series. It can be seen from the three preceding maps that the area of Heath Row experienced various, largely undramatic, changes during the 19th and early 20th centuries. Although most of the settlements expanded only slowly, the character of the area was starting to reflect the growth of nearby London: the increased cultivation, the railways, the growth of East Bedfont (and the creation of its school), the emergence of Southville and the construction of the Staines Reservoir all show the area’s increased importance as a supplier of goods, services and labour to the vast metropolis that was expanding towards it at an alarming rate. In late 1942, there was increasing demand from the Air Ministry for a base for the new long-range heavy troop-carrying planes, existing facilities in the south of England being inadequate. After some debate, this slightly boggy area of market-garden farms was chosen as the site of a wholly new airfield. Construction work began in May 1944 on land originally acquired from the vicar of Harmondsworth. Although the location was ideal, the terrain was not. 100 million gallons of water had to be pumped out of the ponds and 14 miles of pipes were needed to drain rainwater into a nearby gravel pit. Another task was the clearance and demolition of the hamlet of Heath Row. Few other places have become so posthumously famous. At the time, the Air Ministry’s case must have seemed unanswerable, but doubts exist as to whether there was ever any intention to use Heathrow for military purposes. The fortunes of war were shifting in the Allies’ favour, so making large-scale troop movements by air less likely; whilst the argument for a large new civil aerodrome was clear to those who were considering how post-war Britain might be shaped. Due largely to wartime innovations, aircraft were now far bigger. Commercial air travel before the war was still a novelty – when Prime Minister Neville Chamberlain left nearby Heston Aerodrome for the first of his ill-fated meetings with Hitler in 1938 it was the first time he had been in a plane, which excited little comment at the time – but demand seemed likely to increase substantially in the future. The 1930s plan of four small airports around the capital was now inadequate. Instead, the contemporary logic ran, one larger hub was needed which could be purpose-built for the new aircraft and would be capable of future expansion as the need arose. The main problem was that any civil project on this scale would have led to protracted planning enquiries and divisive financial wrangles within Whitehall. Using wartime powers to requisition the land offered a more certain outcome. The then Parliamentary Under-Secretary Harold Balfour later admitted that he had misled the cabinet on this point in order to expedite the process. Were military use the only requirement, many existing RAF bases could have been converted with far less time and effort. Whatever the real motives, Heathrow was allowed to slip into being almost unnoticed, in marked contrast to the glare of publicity which attended many of its later developments. Heathrow would not have been the first project by a national government promoted under the guise of military exigency, and is unlikely to be the last. In the event this potential conflict of interests and purpose never materialised, for construction was still not complete by the end of the war. The military origins of the project were quietly forgotten and work continued on building what was now unambiguously a civilian airport. This was officially opened in May 1946 with a flight to Buenos Aires via Lisbon, the departing passengers enjoying terminal facilities that consisted of little more than a large tent. At the time, Heathrow’s managers stated, with rare prescience, that it would eventually become the largest airport in the world. The next few years did little to justify this optimism. Numerous problems were encountered with the construction of terminal buildings and the second runway, not helped by post-war restrictions in obtaining suitable materials. As late as mid-1948, Northolt (which Heathrow was intended to supersede) was actually handling more travellers. Yet all these problems were eventually overcome. In 1953, Heathrow handled a million passengers (about the number of people that used it every five days in 2010), and this had increased to 20 million by 1973. Now it is the world’s busiest international airport with over 61 million international travellers in 2010 (roughly the population of the UK) and is the daily workplace of over 76,000 people (roughly the population of Basingstoke). It is the largest single-site employer in the country. Other statistics are more bizarre, though perhaps in their own way no less revealing. 10% of the UK’s perfume sales are made at the airport; a bottle of whisky is sold there every seven seconds; the annual turnover of Heathrow’s shops (about half a billion pounds) is more than the entire GDP of American Samoa. In January 2009 the then Labour Government gave the go-ahead for a third runway and a sixth terminal at Heathrow. The announcement followed several years of lobbying and planning by interested parties which had begun even before Terminal 5 had been completed. The result would have been to increase the annual number of flights from 480,000 to 700,000 and would have required the demolition of 700 homes in the borough of Hillingdon, including all of the ancient village of Sipson and parts of Harmondsworth and Harlington. The decision was not met with unanimous public approval. The debate about expansion rumbled on until the 2010 general election, involving almost every major organisation in British public life. The advocates of the third runway and the sixth terminal – which included the Labour government, the BAA, British Airways, the CBI, the TUC and the British Chamber of Commerce – argued that expansion was essential and that the economic benefits to the UK’s economy would be in the region of £7 billion a year. The opponents – which included the Conservatives, the Liberal Democrats, the Mayor of London and his predecessor, Hillingdon Council, environmental campaign groups, residents’ associations, aid agencies, the National Trust, the RSPB and the local Labour MP – questioned whether the financial benefits (if realised) would outweigh the negative factors of disruption, pollution and noise. In the event, the new coalition government acted swiftly. Within days of the election it announced that the plans for the expansion were to be shelved. The problem was solved – for now. The history of Heathrow does not, however, suggest that the airport will stay out of the limelight for long. Opinions differ as to whether southeast England needs more airport capacity and, if so, where it should be situated. Future expansion plans cannot be ruled out. Heathrow seems set to be at the heart of the debates about the future of transport, development, environmental issues and government policy for many years to come. Expect more enquiries, more protests and more statistics: further blazes of publicity, in short, in contrast to the furtive way in which the airport came into being sixty-odd years ago. This map was created from Ordnance Survey’s New Popular Edition maps which were first published between 1945 and 1946. They have all been carefully scanned, digitally re-projected and enlarged to match the present-day Ordnance Survey Landranger® series. This entry was posted in Map of the week and tagged 1:50000, aviation, Britain, Heritage, Local History, london borough of hillingdon, Maps, Maps London, New Popular Edition, Old Series, Popular Edition, Revised New Series, transportation by Cassini. Bookmark the permalink.